SEAN: Given the beginning and end of September have far more manga than is really sensible, it makes sense that there are also weeks where very little comes out. This is one of those weeks. Guidebooks are quite popular in Japan, but have never sold well in North America for some reason. 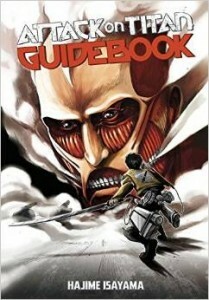 Kodansha hopes that changes with the publication of Attack on Titan Guidebook: INSIDE & OUTSIDE. I think this omnibuses two separate guides from Japan, and will tell you far more than you could imagine about the world of the Titans. ASH: I’m rather curious to read this one, especially since Kodansha has been so adamant about only publishing manga until now. SEAN: Actually, back in the Del Rey days they released guidebooks for Tsubasa. Kodansha also has the 5th volume of Genshiken 2nd Season, which continues to fascinate with its attempts to grab a new BL audience while still courting its old one via the harem antics. MELINDA: So, I never picked this up, because I’d never read the original Genshiken and so on… but I do sort of want to let them attempt to grab me as a BL audience. That’s always fun. So. Hm. ASH: Well, I can say that I’ve been enjoying the second season! SEAN: Speaking of Attack on Titan, for those who enjoyed Kodansha’s release of Before the Fall, the prequel series, the novel it was based on comes out via Vertical, who have said it’s selling even better than hotcakes – and you know how well hotcakes sell. ASH: Mmmmm, light novels. If I recall correctly, Vertical has already had to order a second printing of Before the Fall, and it hasn’t even been released yet! SEAN: The final volume of Bokurano: Ours from Viz has been anticipated for so long that I made the joke about it back a month ago when Ikigami ended. So go look at that entry instead. MICHELLE: I should muster my fortitude and finish Bokurano. I think I will have to do it on a sunny day amidst frolicking unicorns or something, just to keep my spirits up. SEAN: Viz also has the second volume of Terra Formars. So, ignoring that deliberate silence, what will you be picking up next week? Just Bokurano. Next week should prove more awesome with another volume of Goong coming out, I am so excited for it!